While it won’t beat actual cuddles, a good baby bouncer or rocker will make your little one feel comforted. It will also buy you a little hands-free time to finish pressing jobs such as drinking that cup of tea you started an hour ago. 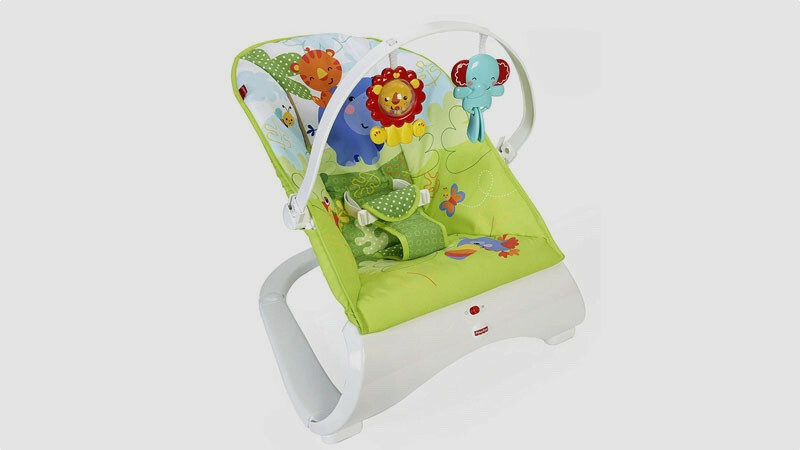 Suitable from birth, the best baby bouncers and rockers offer your child a secure place to sit, doze, kick and play. Designs will vary depending on price, with the more premium models boasting luxurious materials and ergonomic bodies. Before you buy, consider what you want from the seat and added extras. You can choose from a no-frills bouncer, which moves when you bounce it up or down or when the baby jiggles around. 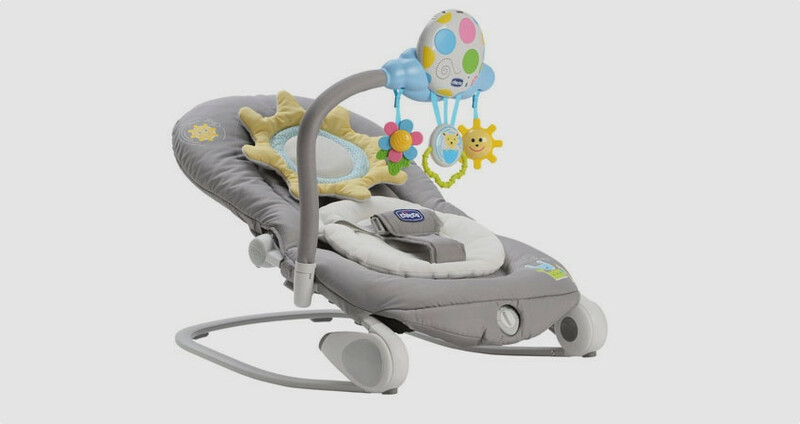 Or, you can opt for a battery-operated design that includes a range of vibrations, relaxing lullabies and a removable toy bar with musical entertainment and colourful stimulation to strengthen baby's motor skills and eye-hand co-ordination. A rocker is slightly different to a basic bouncer in that, with a gentle nudge of your hand or foot, you can rock your child to sleepy bliss or giggling heaven, depending on their mood. You will however find some designs that describe themselves as both bouncer and rocker, and here we’ve included some favourites in our round up of the best baby bouncers and rockers around. For something stylish and unobtrusive in your living room, the Bjorn Bouncer Balance Soft is just the ticket. Shown in a sophisticated black and grey finish, there’s also a stylish beige, orange and silver version. The contoured body will support your newborn’s neck, head and back, and the padded safety harness will adjust with the growing baby - it can in fact be used as a comfy seat for toddlers up to two years. The three adjustable reclining positions come in useful for sleep, play and snack time too. The design will naturally bounce with your babies movements as they kick and wriggle, so there is no need for batteries, and the anti-skid pads on the base will keep it in place. While it may not be as stimulating for babies as some of its competitors, there is an optional wooden removable toy bar available. It can be folded flat to make storage and travel easy, which is ideal when you want to use it at Nanny and Grandad's house at the weekend too. A great sub-£50 model, this design describes itself as both a bouncer and rocker and can be used for babies up to 11kg. It’s a complete contrast to the minimal styling of the Baby Bjorn Bouncer Soft and comes sporting Fisher Price’s vibrant Rainforest print, which you’ll also find on its iconic Rainforest Jumperoo. On board, there’s plenty to entertain your little one - a removable toy bar with reach-and-grasp elephant and lion clacker and rattle can be kicked and prodded to heart’s content. The curvaceous design has no-skid feet to keep the model firmly in place and has a practical machine-washable seat pad. To make use of the calming vibrations you will need to kit it out with batteries, and you may find yourself getting through quite a few if you forget to turn it off. If you find yourself out of juice, you can always manually jiggle the design to create a soothing bouncing movement and keep your child content. If you’re willing to spend the extra cash, this is a state of the art rocker of kings. 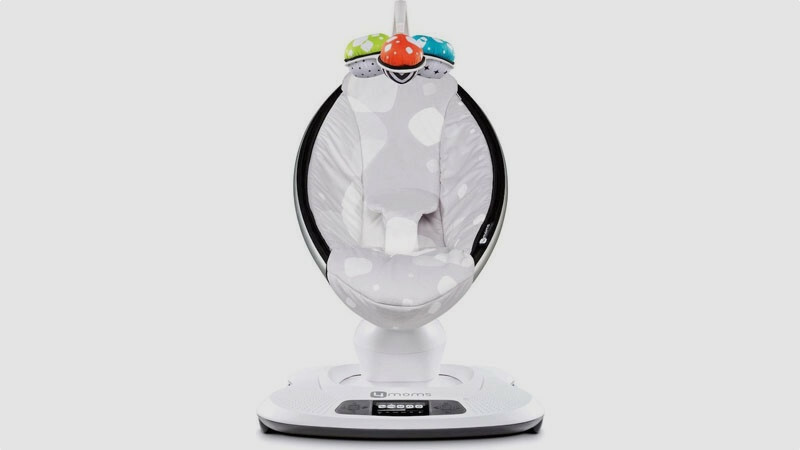 What makes it stand out from the crowd is that it offers up to five unique motions and five different speeds to keep your baby happy – this includes ‘car ride’, which may just save you time having to drive around the block 50 times to get your little one to sleep. 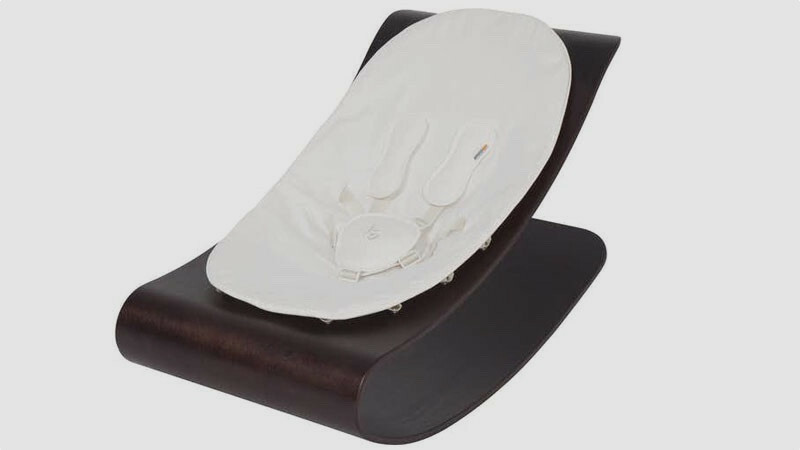 Suitable from birth up until baby is 9kg, it has multiple reclining positions. At 65cm high, its textile, plastic and metal frame may not be thing you want crowding your living space, but the upside is that it does offer some clever smart features. As well as four built-in sounds, it lets you connect to your phone to play your child some of your favourite tunes. It’s also Bluetooth enabled, which means you can control the motion, sound, speed and volume from your compatible smart device. There’s nothing more soothing to a child than the sound of Mummy or Daddy reciting ‘Mary had a little lamb’ as enthusiastically as possible - jazz hands a bonus – and the great thing about this bouncer is that you can use it to record and play back your own voice, whatever the tune. As well as offering calming vibrations, it also comes with a melody-packed toy bar, which you can place on your baby’s cot when required. 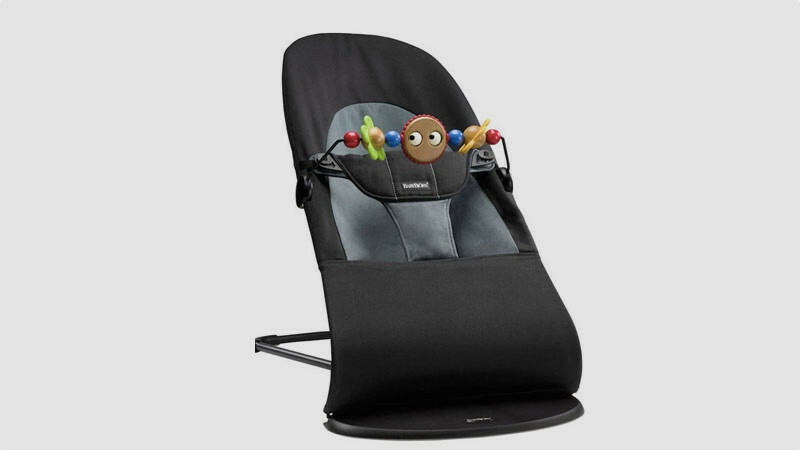 The bouncer is adaptable and lets you adjust the headrest to three positions and then remove it as your baby grows. You can choose to have it in fixed or rocking mode too. This grey finish will subtly blend into your furnishings but you can find versions in a punchier teal and lavender, and the lining can be easily removed for washing. When you’re not using it you can fold it up for neat storage, which is ideal if you’re short on space. Baby bouncer designs don’t get much more beautiful than Bloom’s Coco Wood Rocker. While it may not come with a toy bar or musical components, it does have a smooth, self-rocking motion and its simple styling makes it a definite heirloom of the future – something you’ll want to keep and pass down generation after generation. Suitable from birth to 25lbs, it’s made from a single piece of Baltic birch bentwood, and its smooth body and minimal good looks is a cool tonic for tired eyes. The seat pads come with a 5-point harness in pure cotton or leatherette materials in a range of colourways - including Coconut White (shown). For some, its contemporary styling may be a little too minimal, but not for mum of three Keri Knight from Surrey: ‘I don’t believe newborns need the same toys dangled in their face everyday,’ she says. ‘When you use a rocker such as this babies are happy people watching or holding everyday items such as a bunch of keys.’ Good point, well made, we say.